Former motorcycle dispatch rider and MT driver B.A. 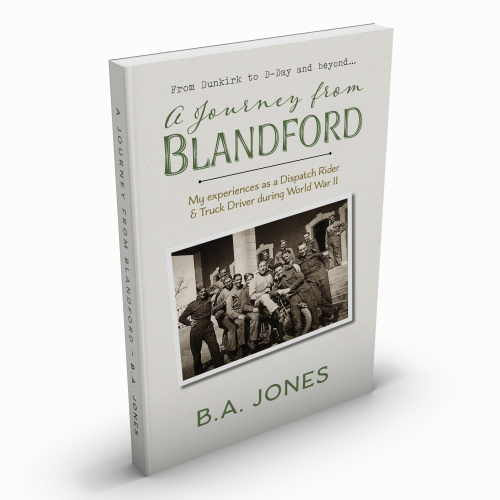 Jones has a wealth of memories of World War II, which include eyewitness accounts of some of the major events of the war in which he was personally involved. He trained at Blandford Camp in 1939 and went to France with the British Expeditionary Force, serving as a motorcycle despatch rider until the British were forced into retreat. At Dunkirk the troopship he boarded was heavily strafed by enemy aircraft. Many were killed but he miraculously survived. Later, he was sent to Egypt & Libya with 2nd Corps Troops Supply Column, where he drove supply trucks for the British 8th Army during the desert campaigns. After many adventures he returned to England to prepare for D-Day. He experienced the beach landings and then drove supply trucks from the prefabricated Mulberry B harbour at Arromanches, continuing with the Allied advance across France and into Belgium to finally witness the amazing scenes of jubilation after the liberation of Brussels. His first-hand accounts of these events make for entertaining reading.